Background and objectives Peritoneal clearance of albumin—unlike the transport of small molecules—is defined by both vascular surface area and size-selective permeability. Few studies have supported a positive correlation between peritoneal albumin loss and mortality. The aim of this study was to investigate whether baseline peritoneal loss and clearance of albumin and other proteins is a risk factor of death in peritoneal dialysis patients. Design, setting, participants, & measurements All incident peritoneal dialysis patients in our center during the last 15 years were included. Mass-transfer area coefficient of creatinine and peritoneal clearances of albumin, β2-microglobulin, α2-macroglobulin, and immunoglobulin G were calculated during a standard peritoneal permeability analysis. The total amount of albumin loss in the dialysate was also calculated. Overall mortality was studied with an intention-to-treat analysis. Results Two hundred fifty-seven patients were included. High baseline albumin clearance was associated with fast transport status, the presence of peripheral arterial disease, and a high comorbidity index, whereas C-reactive protein levels did not differ from the patients with low albumin clearance. Age, high comorbidity score, C-reactive protein levels >10 mg/L, and a low serum albumin were associated with mortality. Peritoneal albumin clearances and albumin loss were not associated with death in crude and adjusted analysis. Similarly, peritoneal clearances of immunoglobulin G, α2-macroglobulin, and β2-microglobulin were not determinants of survival. Conclusions Baseline peritoneal albumin and protein clearances are associated with signs of comorbidity, but this does not have a measurable effect on patient survival. The loss of serum proteins in stable continuous ambulatory peritoneal dialysis (CAPD) patients averages 5 g per 24 hours, 4 g of which is albumin (1). Other proteins include transferrin, immunoglobulins, complement factors, β2-microglobulin (β2m), and α2-macroglobulin (α2m). Marked differences are present between individual patients, but also the coefficients of intraindividual variability are higher (on average 17%) than those for small solute transport (7%) (2,3). This can be explained by the dependency of protein transport on both the effective vascular surface area (the number of pores) and the intrinsic size-selective permeability (the diameter of the large pores) (4). The protein losses in peritoneal effluent are usually compensated by an increased albumin synthesis in peritoneal dialysis (PD) patients (5). However, this process is suppressed if inflammation coexists. Consequently, hypoalbuminaemia can be considered as a marker of comorbidity and illness (6,7), rather than a marker of malnutrition. Additionally, a low serum albumin can be due to overhydration (5). In a small study, Struijk et al. (8) not suprisingly found no relationship between hypoalbuminaemia and albumin clearance. Nevertheless, other studies suggest that an increased protein loss in the effluent is induced by inflammatory markers in the circulation (9). Similarly, the presence of fast peritoneal transport status (defined as high diffusive peritoneal transport rate for small solutes, in other words increased effective vascular surface area) may be a local or systematic manifestation of inflammation. Subsequently, fast transport status has been associated with hypoalbuminaemia (10), high comorbidity status (11), mortality, and technique failure (12,13). However, it should be emphasized that the latest data cast doubt on these associations (14–16). Since 2002 studies have been published on peritoneal transport of total protein and its association with patient comorbidity and survival (17–22). These studies postulate that protein leak across the membrane (like small molecules transport) may be increased by systemic inflammation and therefore may be a mortality risk factor. The calculation of peritoneal protein losses in these studies was based on the Peritoneal Dialysis Capacity (PDC) test (17,20,21) or the total amount in 24-hour dialysate collections (18,19,22). The aim of our study was to determine the association between peritoneal albumin clearance and albumin loss with mortality and technique survival at the beginning of PD. Our calculations are based on data obtained during a standard peritoneal permeability analysis (SPA) (23). Furthermore, we aimed to explore any relationship among other protein losses in effluent, like α2m, IgG, and β2m on comorbidity and survival. All incident patients who started PD at our hospital in the last 15 years were included in this prospective observational study. In all patients a SPA was performed in the first 6 months of the treatment. All SPAs were performed during a 4-hour dwell with Dianeal or Physioneal 3.86% glucose dialysate (Baxter Healthcare, Castlebar, Ireland), as described previously (24). Dextran 70 (a volume marker) was used in test bags to calculate peritoneal fluid kinetics. Dialysate samples from the test bag of 10 ml each were collected before inflow and at 10, 20, 30, 60, 120, 180, and 240 minutes after instillation of the test solution. After drainage at 240 minutes, the peritoneal cavity was rinsed with Dianeal or Physioneal 1.36%. Samples from this rinsing bag were used to calculate the residual volume. Peritoneal solute and fluid transport parameters were calculated as described previously (23). Mass-transfer area coefficients (MTAC) of low molecular weight solutes were calculated according to the Waniewski model. Patients in the highest quartile of MTAC of creatinine (>13.17 ml/min per 1.73 m2) were considered fast transporters. For the measurement of the effective lymphatic absorption rate, the disappearance of dextran from the peritoneal cavity was used (25). Transcapillary ultrafiltration during the dwell was calculated by subtracting the initial in situ intraperitoneal volume from the theoretical intraperitoneal volume at any time point, when both effective lymphatic absorption and sampling were neglected. Protein clearances (Cl) were calculated to express the transport of macromolecules according to the equation Cl(ml/min) = (PrDr + PrRv)/(Prp)t, where PrDr is the dialysate protein content in the drained test bag, PrRv is the dialysate protein content in the residual volume, and Prp is the plasma protein concentration in time (t). Albumin, IgG, α2m, and β2m were measured in blood, dialysate sample at 240 minutes, and residual volume. Moreover, albumin loss in the effluent (expressed as g/L per 4-hour SPA duration time) was calculated by multiplying the clearance of albumin with serum albumin concentration. The total dextran concentration in dialysate was measured by HPLC. Albumin, IgG, and α2m were all measured by nephelometry (BN 100; Behring, Marburg, Germany) using commercial antisera (Dakopatts AB, Glostrup, Denmark). β2-Microglobulin was determined with a microparticle enzyme immunoassay with an IMx system (Abbott Diagnostics, North Chicago, IL). Demographic data and laboratory parameters were collected at the beginning of the therapy. Residual renal function (RRF) was determined from a 24-hour urine collection and was calculated as the mean of creatinine and urea clearance, corrected for body surface area (ml/min per 1.73 m2). Inflammation was assessed by the determination of serum C-reactive protein (CRP) levels, using an immunoturbidimetric method. Patients with serum CRP values >10 mg/L were considered to have inflammation. Davies comorbidity index (26) was scored at the start of PD. The score is based on the presence of seven comorbid conditions, leading to three risk groups: low, medium, and high risk. The low-risk group had no comorbidities, whereas the high-risk group had three or more comorbidities. The mesothelial cell mass marker CA125 was measured in the 4-hour effluent of the SPA by means of a microparticle enzyme immunoassay using a monoclonal antibody against CA125 (Abbott Laboratories IMx). The appearance rate of CA125 (AR-CA125) in the dialysate was calculated by the drained volume and the duration of SPA. Values are expressed as means and SD or median and interquartile range (25th to 75th percentile) for continuous variables and as percentages for categorical variables. For continuous variables, differences were tested with the t test. The χ2 test was used for categorical variables. Mann-Whitney U test was used for variables that violated any assumption of the independent t test. Significance was considered at P ≤ 0.05. All statistical analyses were performed in SPSS for Windows 16.0 (SPSS Inc., Chicago, IL). Several survival analyses were performed. In the first one, an intention-to-treat analysis was used to study overall patient survival. In this analysis modality switches were ignored. The event was death, whereas patients were censored for transplantation, end of the study (December 2009), and last available follow-up data. Maximum follow-up was 5 years from the start of dialysis. In the second analysis—focusing on technique failure—the event was permanent switch to hemodialysis. Temporarily switches to hemodialysis (<3 months) were ignored. Patients were censored for death, transplantation, end of the study (December 2009), and last available follow-up data. 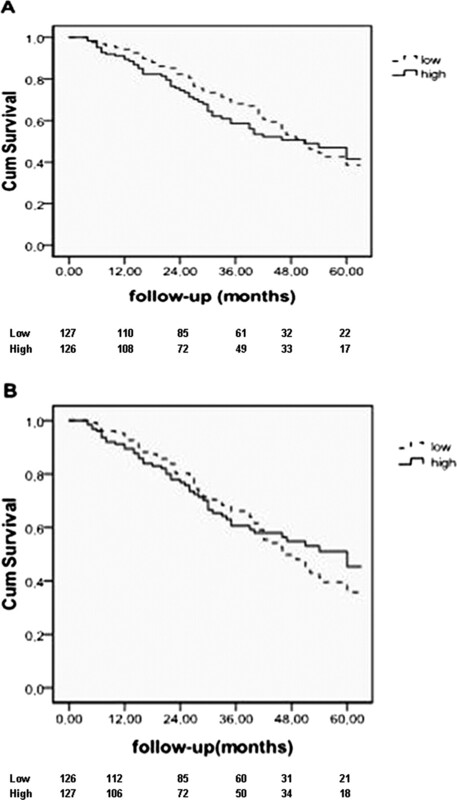 Survival was examined by comparing patients above and below the median value of clearance of albumin (cutoff 93 μl/min) and peritoneal albumin loss (cutoff 0.77 g/L per 4 hours) with the Kaplan-Meier method and the log-rank test. A Cox proportional hazards model was performed to analyze the effects of several variables on mortality. Patients' survival time was calculated from the baseline. In total, 257 adult patients were included in the study. They were all incident PD patients and the SPA was performed within 3.9 ± 2 months from initiation of PD. The general patient characteristics at baseline are shown in Table 1. Diabetes was the primary kidney disease in 20% of patients, whereas 35.5% had low Davies comorbidity score. CRP values were available in 111 patients. Compared with the 146 patients without CRP values, patients with CRP had higher baseline MTAC creatinine (11.2 ± 4.2 ml/min per 1.73 m2 versus 10.1 ± 3.8 ml/min per 1.73 m2; P = 0.04). No other differences existed with regard to age, serum albumin, RRF, diabetes, prevalence of peripheral vascular disease (PVD), and cardiovascular disease. Some (3.5%) of the patients were anuric at the baseline. Patients were divided into two groups (low and high) according to the peritoneal Clalb (Table 2). Groups with a high and a low peritoneal clearance of albumin had similar age, diabetes prevalence, RRF, and proteinuria. In the patients with a higher clearance of albumin, a high comorbidity score (although not statistically significant) and the presence of PVD were more prevalent compared with the group of patients with lower Clalb. However, serum CRP levels were not different between the two groups. Moreover, the patients with high albumin loss had a higher MTAC of creatinine and urea and higher clearances of IgG, β2m, and α2m. They also presented with lower ultrafiltration rates and higher dialysate AR-CA125. In the intention-to treat analysis 107 deaths (on hemodialysis or peritoneal dialysis) were recorded during the follow-up; 82 patients were transplanted. Median survival time was 51 months (95% CI: 43.5 to 58.5). The Kaplan-Meier curves showed no survival differences between the two groups of patients (high versus low peritoneal Clalb/peritoneal albumin loss, log-rank P = 0.51 and 0.69, respectively) (Figure 1). In the univariate Cox proportional hazards model, age, a high Davies comorbidity index, serum CRP levels >10 mg/L and serum albumin were all associated with mortality (Table 3). MTAC of creatinine as continuous variable or as categorical variable (fast transporters versus non fast transporters) was not associated with death (Table 3). Peritoneal albumin clearance and albumin loss (as continuous variables) were also not associated with death in crude and adjusted analysis (Table 4). Similarly, peritoneal clearances of IgG, α2m, and β2m were not associated with survival (data not shown). Kaplan-Meier survival curves for patients with low and high peritoneal clearance of albumin (A) and albumin loss (B) (intention-to-treat analysis). The number of patients at risk is given below the horizontal axis. The difference between the two groups was not significant (log rank test, P = 0.51 and 0.69, respectively). In the technique-failure analysis, 45 events (permanent switch to hemodialysis) were recorded. The Kaplan-Meier curves demonstrated a technique-survival difference between the two groups of patients—the patients with lower albumin loss had better technique survival than those with higher albumin loss (log rank P = 0.029). However, in the multivariate Cox model, Clalb (or albumin loss) tested as a categorical variable (high versus low Clalb group) and adjusted for age, serum albumin, MTACcreatinine, and Davies index lost its impact on technique survival (data not shown). The present study on peritoneal abumin loss and peritoneal clearance in incident PD patients is the largest one published with regard to the number of patients and the duration of patient recruitment. The absence of a relationship with mortality is our main finding and will be discussed extensively below. Patients with higher baseline albumin clearances had also a higher MTAC of small molecules (creatinine and urea) and a higher prevalence of PVD and high Davies comorbidity index, although the last association was not very strong. Also, the effluent concentration of the mesothelial cell marker CA125 was higher. However, the CRP levels were the same in both high and low Clalb groups. Similar results were found when albumin clearances were replaced by albumin loss or by clearances of β2m, IgG, and α2m. The latest findings show that PVD—a marker of cardiovascular disease and mortality in chronic kidney disease patients (27)—is associated with increased peritoneal transport of macromolecules in general and is not specific for albumin. It also implies that an analogy with microalbuminuria, as has been suggested in some studies (17–19), is very unlikely. All of the above data support the hypothesis that peritoneal transport of macromolecules is high in patients with an inherent fast transport status, which can be due to either inflammatory mediators like IL-6 or the presence of a large mesothelial cell mass, which is expressed by high CA125 levels (28). The latter leads to peritoneal production of vascular endothelial growth factor (29) or IL-6 (30) and is not dependent on comorbidity or systematic inflammation. In contrast to the smaller studies with shorter study periods than the present one, no association between albumin clearance or albumin loss and survival was found. Our study reconfirmed that factors like age, serum CRP (31) and serum albumin levels (32) are determinants of survival. Although hypoalbuminaemia may reflect a high inflammatory status that determines outcome (6,7), high peritoneal losses are locally regulated by cytokines like IL-6 and do not correlate with the systematic condition. It is noteworthy that despite the fact that serum albumin is inevitably interfered in the estimation of peritoneal Clalb, it does not affect the absence of an association between Clalb and mortality. Several explanations can be given for our controversial results. First, the majority of the aforementioned studies were based on the PDC test, in which serum and dialysate concentrations of total proteins are used (17,20). In case total protein in serum was not available, an estimation of total protein was done from albumin. However, it should be noted that total protein in dialysate originates not only from the plasma but also from local production of proteins and peptides by peritoneal tissues or cells also contribute (33). Patients with high comorbidity may have high secretion rates of the above-mentioned proteins and thereby a higher total protein clearance than that for albumin. In the rest of the studies, serum and dialysate albumin was measured by a colorimetric method, a less precise method and more prone to interferences with globulins (34), compared with the nephelometry used in our study. Furthemore, the PDC test gives an estimation of the large-pore flow, the flow of serum proteins (pure plasma flow) through the large pores. It should be noted however that albumin (radius 36 Å) is able to pass—although to a limited extent, through small pores (radius 40 to 47 Å). This makes the PDC test clearly inferior to a highly standardized investigation in which clearances of individual serum proteins are measured and for which normal values have been established in a large number of patients (24). Peritoneal protein clearances are determined by the effective peritoneal surface area (the number of mainly small pores) and the intrinsic permeability (the average radius of the large pore system) (4). A large effective peritoneal surface area is functionally represented as a fast peritoneal transport status. This condition has been associated with increased mortality in CAPD patients using conventional glucose-based dialysis solutions (12). However, the use of icodextrin and automated peritoneal dialysis has made this association disappear (14–16). The present study confirms that an inherent fast peritoneal transport status is not associated with a reduced survival. Moreover, this is not only present when low molecular weight solutes are studied but also is the case for protein clearances. This unravels the myth that there would be something special in peritoneal albumin loss and patient prognosis. The strengths of our study are the large number of patients, the duration of follow-up, and the use of the SPA. Potential weaknesses are the single-center design of the study and the fact that CRP values were not available in all patients. However, there were no substantial differences between the groups with and without CRP values. In conclusion, baseline peritoneal albumin clearances and dialysate losses were associated with some signs of comorbidity, just like the presence of a fast peritoneal transport status, but this did not have a measurable effect on patient survival. Part of this study was presented in abstract form at the XLVII ERA-EDTA Congress June 25 through 28, 2010 (Munich, Germany) and at the 13th ISPD Congress July 23 through 26, 2010 (Mexico City, Mexico).